Why I'm Enjoying My Visit To Skylark Farm. 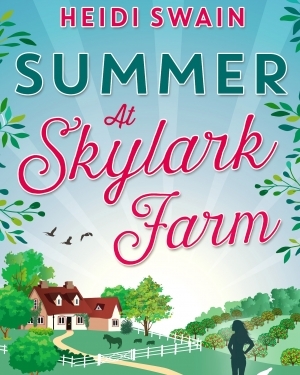 Yesterday I started reading Summer At Skylark Farm, Heidi Swain's newly published second novel. This time last year, I was reading her debut novel, The Cherry Tree Cafe. I'll be honest - I'm not a reader of chicklit or contemporary romance. I don't know whether these are labels that Heidi or her publisher, Books & the City, would apply to her writing and I'm happy to be corrected. I am always on the look-out for a good saga. Carol Rivers' family-based dramas are an excellent example - character-driven stories with compelling plots and strong emotional threads running through them. I also enjoy mysteries, suspense, thrillers and psychological novels; and I have long had a soft spot for American cosy crime. I was in the library a couple of days ago, looking through the romance section, which is where they shelve the sagas. These days it seems that most books here contain the word "chocolate" or "cafe" or "bake-off" or "little shop" in the title. Sorry. Not interested. Second World War-based sagas are what I'm most keen on at the moment. So how come I read The Cherry Tree Cafe last year? Well, had it been written by anyone else, I wouldn't have. But I had a Twitter-acquaintance with Heidi, on top of which we are fellow members of a Twitter-based group of writing friends, and so I read her book. And it was a delight. She writes with a light touch, creating characters to care about and throwing questions into the plot that draw the reader further into the story. So here I am again one year on, reading her second novel. The difference is that this time around, I'm not reading it because of a Twitter-friendship. I'm reading it because I enjoyed the first one. So what is it about Heidi's writing that appeals to this saga/thriller/crime reader? Quite simply, it is what I can only describe as the feel-good factor. Heidi writes with real warmth. She clearly loves her characters and her fictional world and that feeling informs her writing. Her books invite you to snuggle up and relax. And while that is not what I normally look for in my reading, I find myself enticed in. That feel-good factor is surprisingly appealing. What types of fiction do you prefer? And have you ever found yourself enjoying something that was a different style of book? Any recommendations for my ever-increasing TBR pile? Thank you so much for reading and commenting Louise and Jen. I can't even begin to describe how humbled I am by this wonderful post from Susanna. I'm overjoyed to discover that my novels fall into the feel-good fiction category! The thought of making people 'feel good' is wonderful. That's exactly why I write so it is reassuring to know my efforts are hitting the spot. I hope you enjoy your trip to Skylark Farm Jen. It is somewhere I hope to go back to in the future. I love the idea of 19th century chicklit, Jen! I'm interested to hear that you steer clear of reading your chosen genre when you are working on your first draft. I hope you enjoy Summer at Skylark Farm. I'm sure Heidi will be delighted to know it is top of your TBR pile. I love books with a feel-good factor and am just about to start 'Summer at Skylark Farm.' I read mostly contemporary romance and women's fiction, although because it's also what I write, I don't read it when writing the first draft of a story. When first drafting, I escape into the world of historical fiction or diaries. At the moment, I'm reading the diary of an Englishwoman who settled in Upper Canada in the 1830s. It's a fascinating glimpse into a very different time by a woman who also held some surprisingly modern views about women's roles. And there's a romance too...maybe my reading choices don't actually stray too far away from my preferred style after all? The diary or memoir as nineteenth century chick lit?!! I agree with you, Louise. Readers know what appeals to them and that is the kind of book they look for. Obviously, not everyone is like that, but I think it is true of many readers - possibly most readers. I'm glad if I have made Heidi's books sound appealing. Thanks for sharing your thoughts. It's always good to hear from you. You raise an interesting point, Susanna. It is easy to "stick with what you know." Readers know what they like and they want more of the same, but maybe it can be a good thing to try something different and possibly be pleasantly surprised. I like your description of Heidi Swain's books as "feel-good" books. That sounds lovely.